I love outfit #2. You’ve added your own unique spin to it and it looks fabulous. Lately I’ve been so drawn to gingham too!!! I can totally see why you snagged this dress. But I have to know—are you keeping it?? I do love the length only because it’s nice to have some variety in our closet. And especially for those times you’re sitting more than standing!! But even so–that’s such an easy fix if you wanted it a little shorter!! 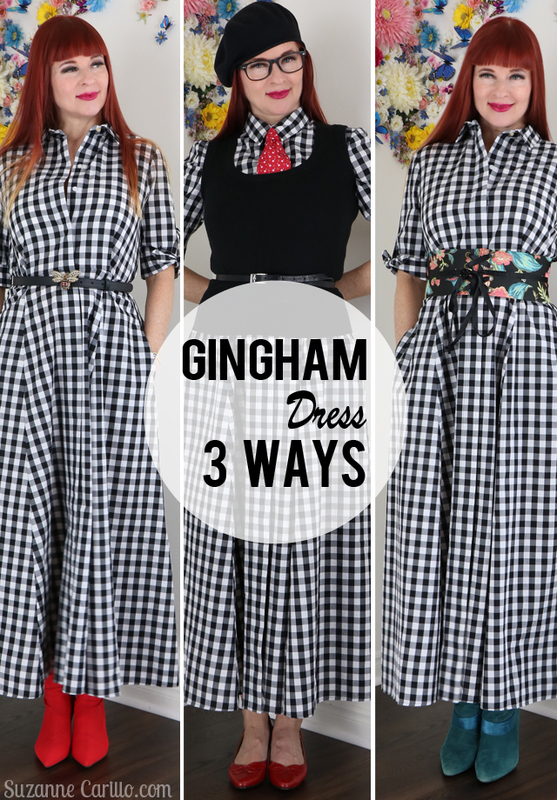 Now you’re making me reconsider the vintage gingham maxi I’ve had for eight years that I’ve just added to the stockroom rails! You look fabulous in each and every combination. PS You’ve got problems commenting on my blog. 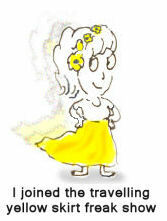 I’ve got problems with yours updating in my feed both on Blogger and Bloglovin’. What’s going on? 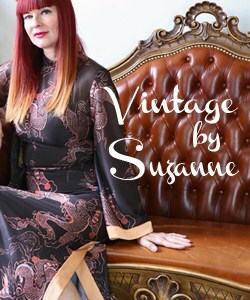 Oh I do love a bit of gingham too Suzanne and have to say that your second styling nails the potential of this dress. I understand and agree with your reservatations about the length and fullness of the skirt but by wearing the vest it does away with those concerns. Surely you convinced yourself to keep this if we have even more stylings to come? woww, I do love gingham, and I love your dress, particularly that second outfit, and you look particularly gorgeous in it!. I like that sleeveless sweater which looks like a vest, and the cute tie, those details rock!, absolutely lovely! I love your ingenuity with fashion. It’s no surprise given your general creativity in everything. I learn from watching you explore style. 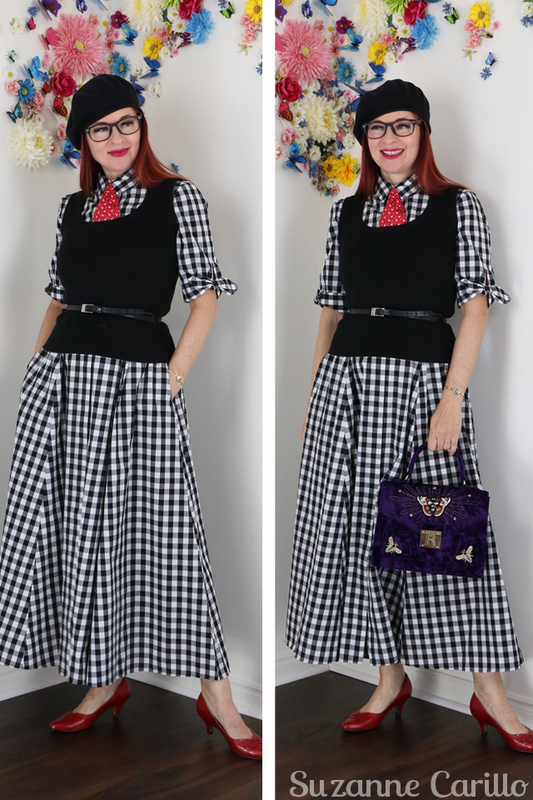 Fabulous gingham ensembles! Love it broken up with the vest and accessoried with the tie. 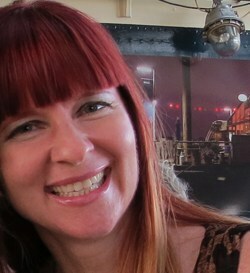 It looks fabulous, every which way, I hope you keep it..it is fabulous on you despite the challenging length. Where are our man servants when we need them !!! Not a gingham fan, but you make it look cool. Bravo! Enjoyed your fab styling. Oh yes! This is a keeper. The outfit with the tie and black vest is my favorite, but really, they all look amazing on you. I could see you wearing them all to a variety of events, such as tea, museum exhibits, a matinee. This dress has your name written all over it–in gingham. Gingham is never out of style! It reminds me that spring is coming! I love the second outfit. Brilliant dress. If the sleeves were over the elbow, I eould say, buy one for me and send it. (And then hope it would look as good on me as it does on you. Gosh those sock boots are good, right? I have no preference for a look. I think all three are equally brilliant. And that doesn’t happen too often. Cannot wait to see the other stylings. I love the wider belt- it keeps the dress from looking sloppy and creates a nice shape while also breaking up the pattern. 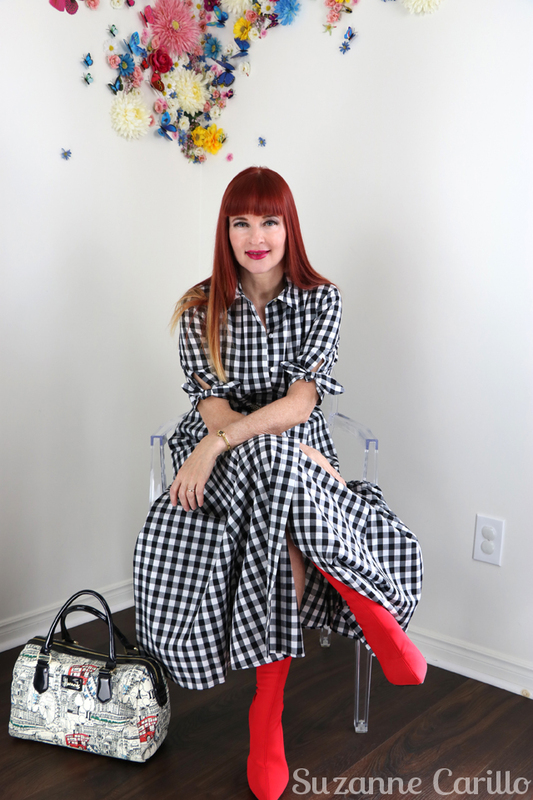 Gingham is timeless and who among us is immune from the lure of retail? I think the dress looks great all ways, but of course #2 with the black beret and layering is my favorite. Thanks for sharing with Hat Attack! I’m not a big fan of gingham, but the black and white may just win me over. I think this is a great dress, and I hope you decided to keep it. The addition of the vest, belt and tie is my favourite styling of the three. What a classic silhouette and fabric! I just love the version with the vest and red tie. I’m so curious about whether or not you kept this cute frock! 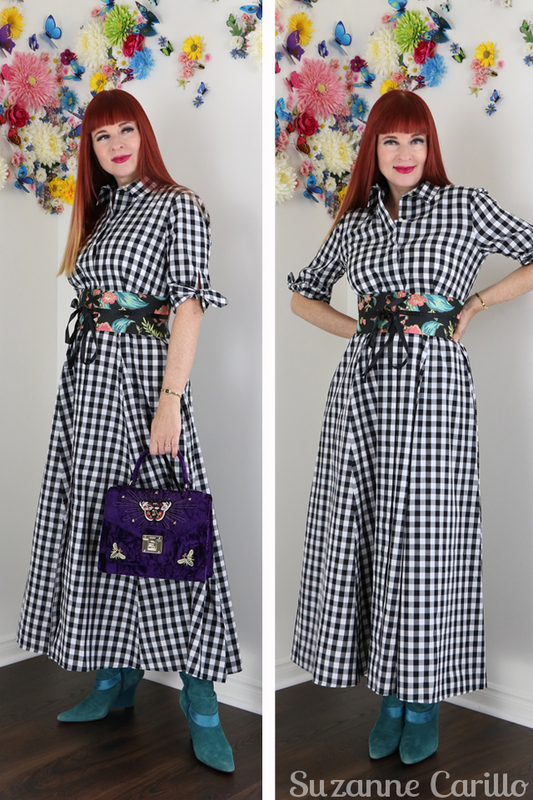 OMG I love this dress so much — I have a lifelong weakness for gingham — and I have pinned outfit #2 for style inspiration. I also love outfit #3 for the obi belt detail.